The latest musician to get involved in the LeBron James saga is rapper Drake, who took advantage of The King’s presence at a recent concert in Cleveland. At the concert Drake calls up LeBron onstage, to which he is greeted by chants of MVP. He even lets LeBron perform with him, in a Lil’ Jon-esque cameo shouting “Hey” while Drake spits his flow. Thanks to BlackSportsOnline.com for the video. Nets co-owner Jay-Z won’t be the only musician recruiting LeBron James this offseason. LeBron is known to be an avid hip-hop fan, but that didn’t stop a band member from an entirely different genre from reaching out to the superstar. My Chemical Romance, a metal/punk-rock band, guitarist and apparently big Knicks fan Frank Iero took to Twitter to make LeBron a special offer: Free MCR tickets for life if King James makes his way to New York next season. I’m not sure if MCR is willing to go as far as to make a video similar to the “We are LeBron” parody performed by loyal Cavaliers fans, so they better hope that he’s enticed by the thought of being part of the MCRmy. 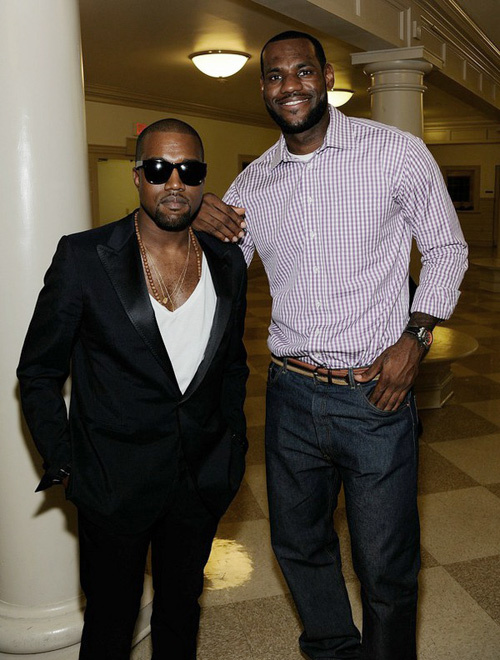 LeBron and Jay-Z are certainly friendly toward each other, as seen in the video below. I can’t think of a better person to persuade James to the worst team in the NBA besides the rap superstar. Or namely, the elimination of the Cavaliers. Since Kobe has signed an extension, it’s no secret that the renowned filmmaker wants the superstar on the Knicks, his favorite team. Rap mogul Jay-Z has also been trying to lure LeBron. Perhaps all the city needs is a Eli Manning/Derek Jeter combo to push him over the top. I’m sure if The King decides to make New York his new destination, Spike would toss in a documentary of some sort. Heck, I bet just a film of James signing a max contract with the Knicks would rake in millions in New York.